Irritable bowel syndrome and digestive diseases (such as Crohn’s and ulcerative colitis) are complex disorders accompanied by a myriad of symptoms, which can make daily living very difficult. While there is not yet a cure for these conditions, a healthy, balanced diet can help alleviate suffering and enable you to enjoy a healthy, productive life. 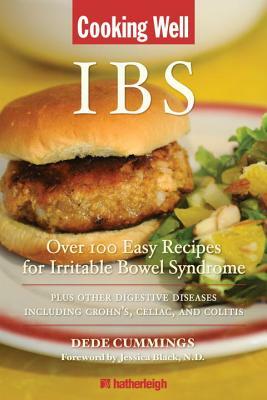 Whether you have a digestive disease yourself or are looking to cook for a friend or family member with digestive problems, Cooking Well: IBS offers a varied selection of recipes created specifically to help aid digestion and improve gastrointestinal health. Some of the over 100 easy and delicious recipes featured in Cooking Well: IBS include Gluten-Free Banana Granola Pancakes, Butternut Parsnip Soup, Chickpea Salad with Lemon and Parmesan, Cracked Crab with Curry and Ginger Sauce, Wild Rice Casserole, Chicken Tarragon, Chocolate Mousse with Raspberry Sauce, and more. The Cooking Well series is specially designed to augment the treatment and symptom management of your disease through the benefits of specific, nutrient-rich foods. Featuring delicious and healthful recipes that are easy to prepare as well as helpful tips and information about the role of nutrition for your condition, this book includes everything you need to improve your daily functioning and enjoy your life to the fullest. Dede Cummings, author and Crohn’s patient, has been a book designer for the past 25 years. After her most recent hospital stay and surgery for Crohn’s disease in 2006, Dede began hiking the Long Trail (the length of Vermont) in one-week sections, beginning to realize a long-term goal that had been put off due to illness. In 2010, she co-authored Living with Crohn’s & Colitis with Jessica Black, N.D.